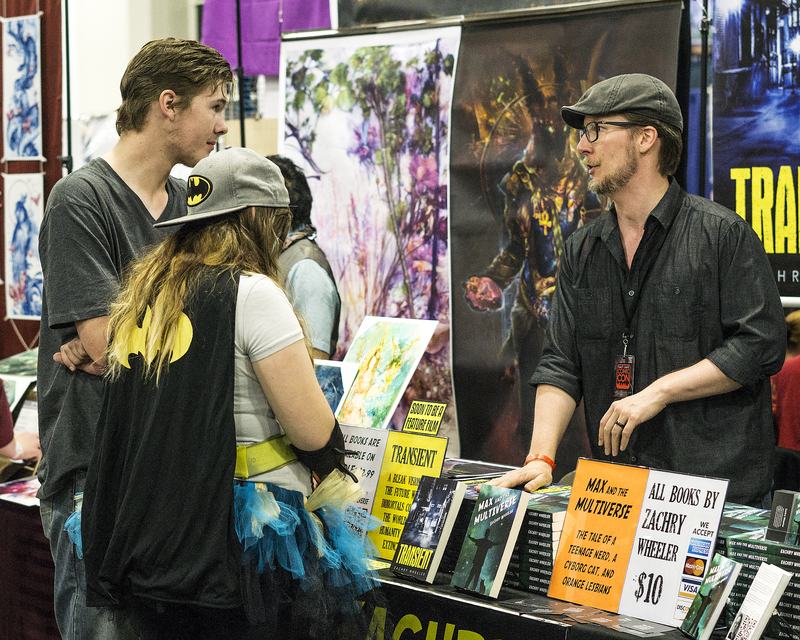 Author Zachry Wheeler stands in his booth talking to convention attendees at Salt Lake Comic Con on September 21, 2017. Wheeler’s first book, Transient, was published November 2016 and is already in development for a feature film. Many authors can call Salt Lake Comic Con their home for a weekend, but how many of them get their first book published with a movie already in development not even a full year later? Zachry Wheeler is that author. Sitting in his booth telling attendees about his two books Transient and Max and the Multiverse, Wheeler has had a wild year to look back on. Wheeler’s book Transient was a 10 year work in progress, culminating in a November 2016 publishing date. Obviously, all of his work has paid off. Not only was his book picked up for a movie, it is already in development with Voltage Pictures, which has brought films such as The Hurt Locker and Dallas Buyers Club to audiences across the world. But, that doesn’t mean it was easy for someone who describes himself as only “competent” with his own writing. Wheeler said he started off with an idea that he put down, but that to truly ever finish, it takes a lot of effort to get to the finish line. “It’s just like any craft: how do you get to Carnegie Hall? Practice, practice, practice,” Wheeler said. Creating is only half the battle, though. Once your book is out there, and your story is ready to be told, the next part is to get it into people’s hands, and Wheeler had a good weekend of sharing his book with readers. To find Wheeler’s books and get updates on the future Transient movie, visit his website.